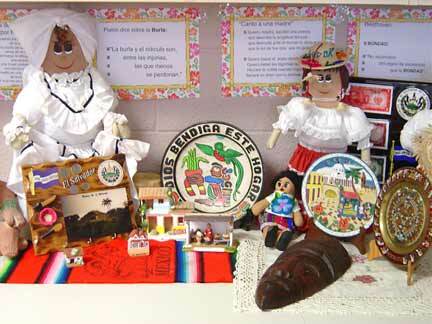 In Ms.Castro's classroom, room 163, students can see varities of many things from Latin American countries. Even students who are Spanish speakers learn about the cultural traditions of the many countries of Latin America. People sometimes think that people who are Spanish are the same. But there are different cultures from the people of Latin America. There are differences in the music, food, and the traditions. The food is a very important and delicious thing to the cultures in the countries of Latin America. In El Salvador the most famous and delicious food is pupusas, which is filled with cheese and meat. In Mexico they usually eat toritllas almost always with pepper. Also in Peru they have a traditional food called ceviche with shrimp, lime, and yucca. In Chile they like to cut empanadas with meal, onion, egg and pasta. In Puerto Rico the arroz con gandules, peas and rice, is popular. In Guatemala they have a different food like tamales known as cuchitos. There are a lot of traditions among the cultures and countries of Latin America. “In El Salvador we usually celebrate las fiesta patronales” Flor Perez said. This is a holiday in May when they have parades and parties. “My favorite holiday in El Salvador is New Year’s that we celebrate on December 31,” Flor said. They have a party with friends and family. All the people like to be outside and they watch a lot of fireworks. According to Yuri Ibañez, the biggest holiday in Peru is the Independence Day which is celebrated on the 28th of July. Another big holiday is the Carnival in February. The most celebrated holiday in Chile is September 18th, Chile’s birthday; on the 19th of the same month there is a military parade. “My favorite holiday is on September 18th because I go out with my friends and drink chicha and wine,” said Angelo Castellini.